Running out of self storage space or underestimating how much you needed is an irritating proposition, but before giving up it is worth considering whether you are making best use of the space within your unit. Even though your storage provider will take primary interest in the floor space size that you are occupying, self storage in actuality is a three-dimensional game, and ultimately it is up to your ingenuity to make the most of the volume of your storage unit – imagine all the wasted space you are paying for that is higher up, above your head, perhaps slightly inaccessible but it is what you are paying for all the same. Back at home we use a remedy for keeping our collections of items stacked up high and out of the way, but easily accessible whenever needed. Yes, it’s just the simple power of shelves, set against wall space. If I didn’t have any shelves I would come home every day to a sea of books and dusty records strewn across the floor space of the living room, and the kitchen would be a trip hazard waiting to happen. I could try putting items into boxes, but that would pose a new complication – if I wanted to find a particular book or jar of spices, it would require some extended sifting through boxes, some packed on top of each other, until I had in my hands what I wanted. Shelves solve all these problems. So why not apply this thinking to your self storage unit and see how far it gets you? Shelves are probably the best way to deal with some of the lighter and smaller items that you may be collecting en masse in your storage space – items that are not sturdy enough for stacking up in boxes on their own, and that may be getting in the way if you need to store more considerably sized objects, or that are simply obstructing floor space to get properly inside the unit. 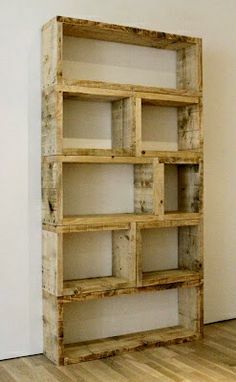 Once your shelving is set up, you can then apply the methodology of getting your lighter items on the shelves, with the heaviest of those occupying the bottom level of shelving, and that will result in a safe way of stacking these items up and making some valuable space for the unit as a whole. It is worth having a conversation with your storage provider or DIY store first of all and find out if they recommend a particular type of shelving. Whilst it might be preferable in the ideal world to have shelving with wall fixtures, this is most likely to be impossible in your unit, and it may be the case that you are looking for a particularly sturdy shelving solution that is self supporting and fits comfortably within the width and height of your unit. For most of us, the other item on the shopping list is a solution of getting to the top shelves if you don’t have one already, such as a small ladder or steps. Other than just for practicality’s sake, going back to the start of the article, shelves can save you money as well as space, and you can postpone for another time or hold off indefinitely the move to a unit with a larger floor area. « Storage Clutter Or Valuables?